In July 2005, Costa Rica passed an immigration reform act to serve as a key instrument for fighting corruption and regularizing the status of a growing migrant population. In accordance with this legislation, the DGME (Department of Immigration) determined that an advanced ID credential system was critical to improving controls on illegal activities, clamping down on the cross-border trafficking of individuals, and protecting victims of forced migration or other abuse. While many governments have undertaken large-scale ID projects, the Costa Rica case is notable in that quality identity documentation was explicitly considered, and ultimately deployed, as a key element in protecting the human rights of the country’s foreign residents. Costa Rica’s rapidly developing economy, modern democracy and strong social security infrastructure represent a strong attraction for economic migrants in a region where wealth and opportunity are concentrated in a few nations. With a population of just more than four million, Costa Rica is host to some 200,000 legal foreign residents. Illegal migrant workers also number in the hundreds of thousands, and consist mainly of low-skilled workers from Nicaragua. Over the years, such a persistent population influx placed heavy demands on the nation’s social welfare system, challenging the delivery of social services and proving detrimental to the inherent rights and privileges of citizens and legal residents entitled to those services. Paper-based foreign resident ID credentials — specifically, the ease with which they could be counterfeited — greatly exacerbated the problem. The country also faced rising border and national security challenges posed by the threat of global terrorism, as well as the daily grind of drug traffickers seeking entry to the United States from Central America. Additionaly and lax border security and corruption in nearby countries enables unregulated movement of undesirable individuals. To address the economic and social impact of this new population dynamic, in 2004 the government began the process of creating a new legal and political framework, formalized by legislation passed in July 2005. The new law was the keystone for a transformation of the country’s migration management system into a flexible, robust infrastructure that can absorb and integrate large numbers of foreign residents while maintaining border and national security, protecting personal privacy and human rights and regulating the flow of immigration. From the start, the government of Costa Rica was unambiguous in its commitment to link such measures to a full consideration of Human Rights. The legislation was developed only after consultation with social, religious, business, academic and other organizations, resulting in the requirement that the public institutions responsible for enforcing the law must adopt the highest standards in protecting Human Rights. Director General of Immigration Mario Zamora explained that the overriding goal of the new legal framework was to ensure protection of Costa Rican citizens’ rights and to spell out the country’s obligations to assist legal migrants. The new framework was also intended as an effective tool to reduce the opportunities for crimes associated with drug and human trafficking and other illegal activities that are increased by some aspects of migration. Additionally, the country aimed to integrate migrants by encouraging their active participation in philanthropy and social work, and promoting their contribution to the nation’s well-being and stability. An essential aspect of the transformation was replacement of the country’s paper-based foreign resident documents with a highly secure, counterfeit-resistant Foreign Resident ID card. The Department of Immigration of Costa Rica (DMGE) decided to standardize on secure ID credentials from LaserCard Corporation similar to those used in the U.S. Permanent Resident Card program (the “Green Card”). Based on optical memorytechnology, the nation’s new “DIMEX” cards introduced in 2008 provide multiple tiers of security and the ability to securely store and protect large quantities of personal and biometric data. Further, the solution addressed privacy considerations since each individual carries his own data rather than having it accessible from many points online, which carries the associated risks of potential database hacking. Confidential personal data is stored in a zone that only a customized secure inspection reader can access. All data is unalterable and what is readable at will is limited to the most basic information. Placing the data within a card that is under the personal control of each individual also takes a major step forward in ensuring that the data will only be shared under the principle of informed consent. The optical memory card technology at the heart of the DIMEX offers individual cardholders and the entire nation the benefits of proven security components. First, optical memory securely stores cardholder personal information including a high-resolution color facial image, fingerprint images and templates (for automatic one-to-one identity verification), digitized signature and biographic data. In addition, the optical stripe features a Personalized Embedded HologramHD, an optical variable device containing a high resolution, high contrast image of the cardholder’s face which, like the digital data stored in the optical memory, cannot be fraudulently altered. Tamperproof and highly counterfeit-resistant, optical memory technology is not subject to the security vulnerabilities associated with documents that rely solely on volatile or clonable technologies. For the Costa Rica DIMEX card to be effective in bolstering national security and human rights, it had to be usable in a variety of situations. 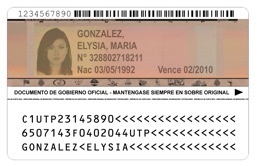 Optical memory based ID credentials enable authorities and inspection agents — whether at the border, a government agency, a bank or an airline check-in desk a — to make a confident judgment about card authenticity and visual identification of the cardholder, even where electronic readers are not available. These credentials are therefore of particular value since electronic readers in large-scale ID card programs are frequently absent or restricted to areas such as key border crossing points. A suite of demographic and biometric data collection and card issuance equipment and software solutions from LaserCard enables the Costa Rica government to manage the full card issuance processes. Steps include the centralized enrollment of approved foreign residents, one-to-many fingerprint identification to prevent the issuance of duplicate cards, optical memory card personalization (laser engraving and optical memory encoding), quality assurance, and card issuance. Biometric identification of adjudicators and workstation operators plus strict card auditing procedures occur at every stage of the process. The DIMEX card is designed to operate seamlessly with a Biometric Verification System for exploiting the strengths of the card in border management applications. DGME chose to apply ISO standards for optical memory which assure international interoperability and transportability of biometrics across system and national boundaries. Costa Rica’s express will to endow its immigration laws and policies with the responsibility for achieving the highest standards of human rights gave rise to a people-centric ID card program that inextricably links document security with individual rights. Setting a clear framework in which human rights are prioritized enabled technology choices that reflected the need to safeguard individual information, privacy and personal identity without sacrificing the state’s ability to protect itself.